Female hair removal has been one of the most popular beauty services for many centuries. Having a hair-free, smooth skin is the number one beauty issue for many women. In this guide you will find all the information you have ever wanted to know​ about female hair removal. Finding the best way to remove unwanted hairs from the eyebrow is very important. ​Eyebrows are for the face like a frame is for a picture - a well-shaped pair of eyebrows can improve the look of the face, but can be very disadvantageous or unnatural if not done correctly. However, it is not only for aesthetic reasons that eyebrow hair removal needs to be as safe as possible but also to protect your eyes. You can easily remove unwanted hairs from your eyebrows; however,if you wish to have a permanent solution, we highly recommend that you to go to a clinic where you will be treated by professionals. Tweezing - ​This is the safest and the most accurate way to remove the unwanted hairs from your eyebrows. You only need to buy a good pair of tweezers once, there is no additional outlay required. Tweezers are available very cheaply, however we recommend you choose a high quality pair as they will be more accurate, durable and most importantly, more comfortable to use. A sharp, slanted style pair of tweezers can be a very good choice. How to Make the Perfect Shape? For the best result you will need a magnifying mirror and a pencil (preferably an eyebrow pencil). ​Create the shape with the pencil: place it vertically right next to the outer edge of the bridge of your nose. The place on your eyebrow where the pencil points to should be the starting point - it should be about an inch above the inner corner of your eye. Mark this point with the pencil. Place the pencil back to the bottom of your nose and by holding it still there, gently turn the pencil to the direction of the outer corner of your eyes. Make a line with your nose and the outer edge of your eye draw a line to the spot where it crosses your eyebrow. This is where the hairs should end. Now you need to find the highest point of the eyebrow: this time make a line with the outer edge of your nose and the outer rim of your iris, and draw a line where it lands on your eyebrow. This should lie right on your brow bone. Now join up all the lines you have drawn - this needs to be the shape of your eyebrow. Draw it as thin or thick as you like, keeping the drawn shape, but remember: thick eyebrows can always be made thinner, but not the other way around! Now you can start plucking the hairs out: just be careful not to remove hairs from the pencil drawn line. When you are done, you can wash off the pencil and enjoy the perfect shape of your eyebrows. Threading - this is an ancient method originating in India. Although it can be a bit more painful than the use of tweezers, it is much faster and highly accurate. We don't recommend it for beginners as it is easy to get off track and remove too much hair.You can ask for threading in many salons as well. Another advantage of this method is that it's extremely cheap: all you need is a piece of thread (cotton or polyester). Tie the ends of the threads together so that it forms a circle, then twist it a few times in the middle, holding the thread with two of your fingers on each side. The twisted thread in the middle is going to remove the unwanted hairs, by making one of the holes bigger or smaller by your fingers on your left or right hand. Be careful - no sudden movements or you can remove more hair than you want to! Electrolysis - For this part of the body, electrolysis is a very popular form of hair removal. Given that the treatment area is very small, precision is a must and it is also permanent, making electrolysis the best choice for long term hair removal. The average person would initially have an electrolysis session of one hour or less with follow up treatments in the 15 - 30 minute range. The cost would be no more than $200 and in return the eyebrow hair would be permanently removed (electrolysis is the only procedure that assures no regrowth upon full treatment completion). Depilatory Creams - It is very difficult to precisely remove hair with this method, quite aside from the fact that it is potentially very dangerous to have such strong chemicals so close to the eyes. Waxing - Although it is possible to combine it with tweezing and it is usually done so if you go to a salon, waxing is not effective on its own, because it is difficult to target hair with precision. If you decide that you want to use wax, we recommend hard wax, but you need to take into account that this method is not permanent. Shaving / Trimming - It is extremely difficult to target correctly with a razor or trimmer, especially if you remove hair below the brow bone. In addition, hairs will grow back very fast and with a stubbly effect. Trying to maintain a natural pair of eyebrows with this hair removal method would be almost impossible. Having visible hair in this area is, for most women, undesirable and can affect confidence in their appearance. Fortunately, there are several ways to remove unwanted facial hair. On the upper chin and moustache area there are usually just a few hairs that grow, but generally these hairs are very coarse and dark. When choosing a hair removal method for this area the requirement is to remove the hair as completely and for as long as possible. Waxing - although both cold and hot wax are widely used for the face, we recommend the use of hot wax as it pulls out hair from the root more effectively. It is not permanent, but can reduce the amount of hair if the treatment is repeated regularly. You'll need to wax every 3-6 weeks to keep the skin smooth. Coil hair remover -​ The only tool you need to buy costs about $15-20 and the method is very similar to threading as several hairs are plucked out simultaneously by getting stuck between the rolls. It is very simple and quick - the hair is removed just by twisting your fingers. Tweezing - if you only have a few, coarse hairs on your chin, you can very easily remove them with a pair of tweezers. Make sure you pull the hair our from the root - the best way to ensure this is by pulling smoothly on one hair at a time, grasping it as close to the skin as possible. Electrolysis - electrolysis is a very popular form of hair removal for this body part because it's the only permanent hair removal method that's been approved by the FDA and is suitable mainly for smaller areas. Each hair is treated individually, one by one, and the follicle is permanently disabled, thus preventing any future hair growth. Very popular for those who don't want the hassle of constantly removing the hair temporarily. Laser - small areas such as the chin or the upper lip can be treated ​in less than a minute and you can reach permanent hair reduction. However, laser is mainly effective if you have light skin and dark hair. That said, there are now a number of lasers on the market that do cater for darker skin types, notably the Alexandrite and Nd:YAG lasers. A very fast and easy method to remove facial hair. Shaving / Trimming - the biggest disadvantage of removing hair with a razor or a trimmer is that the hair grows back after about a day and can often feel stubbly. It also can have the appearance of being darker initially. The arm - especially the lower arm - is a very popular target for hair removal. ​Here even the reduction of the hair can be a good solution as the presence of arm hair is more socially acceptable than hair on other parts. Waxing - The regular use of waxing can make your hair grow back thinner and lighter each time. The waxing session needs to be repeated every 3 to 6 weeks. Epilating - The method is similar to waxing as it pulls hair out of the roots. Its use can be painful initially, but once you are used to it, it is a very easy and quick way of hair removal in the home. The hair shouldn't be longer than 0.6 inch for the treatment - if your hair is longer, trim it before epilating. 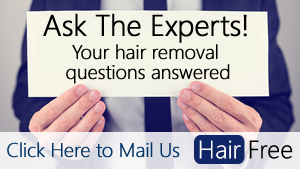 Laser - Although this method does not achieve permanent removal of hair, it can result in permanent hair reduction and slows down ​the hair regrowth. As the treatment area is relatively large and precision is not needed, laser hair removal can be a good option to make your hair notably thinner. Electrolysis - Most people who have lower arm treatment do so to reduce the density of hairs in the treatment area. Electrolysis is mainly used for completely removing hair and would take a very long time to cover such a large surface area given that hairs need to be treated one by one. Hair growth in the armpit region is a normal occurrence, however it can be very annoying not only because of aesthetic reasons, but also because you feel cleaner, more hygienic and hold less sweat without it. Waxing - Removes hair from the root and leaves it smooth for weeks. Epilator - A very fast method that removes hair from the follicles, and no special preparation​ is needed for the hair removal session. The armpit is going to be smooth for weeks after epilating. The drawback is that it's quite a painful hair removal method. Electrolysis - ​The only way to get rid of hair permanently is electrolysis. It is mainly recommended for smaller treatments area like underarm hair and is the only FDA approved hair removal method for permanent hair removal. The amount and strength of abdominal hair can differ from woman to woman. Some women have none or only some light peach-fuzz hair, but many woman can have a larger amount of dark, coarse hair in this area, especially in the vertical line above and below the belly button. If you feel like you have an excessive amount of hair in this area, you can consider having hormonal treatment, however it is usually normal for dark haired people. Waxing - ​Waxing is an ideal non-permanent solution for large treatment areas like the abdomen. It is fast and easy, and regular waxing can reduce the amount of hair and make is softer, too. One of the best home hot waxing kits available on the market. Read more about this product here. Laser - ​A great solution for permanent hair reduction. Laser is ideal for large treatment areas, such as the abdomen, where no special precision is needed and although it won't completely remove the hair, it significantly reduces the density and slows down growth. Shaving / Trimming - As for abdominal hair, the goal is to get rid of the hair, or at least to make it less visible by reducing its density and coarseness. Shaving / trimming can result in the opposite effect as regular use makes the hair grow faster, coarser and darker. The treatment of the pubic area can be very tricky - it can be painful, difficult and requires a lot of time and work. Also, being completely hairless down there is claimed to increase the risk of getting infections. For these reasons not every woman decides to choose hair removal from this area - many of them, in fact, are even against it for moral reasons. There are many ways and trends for bikini hair removal. The term "Brazilian" is used when you remove all the hair you find in that area. "American" when you only remove the hair that can be seen when wearing a swimsuit. "French", when you remove everything but the "landing strip". You can find more about it by reading our full detaile﻿d article﻿ on Brazilian Bikini Hair Removal. Waxing - ​This is the most popular way for bikini hair removal. You can easily do a full Brazilian hair removal for yourself with this method. The hair thins out as you wax regularly. Although waxing can be done less costly in the home, a full Brazilian waxing can be done much more effectively by a professional. A proper technician will put emphasis on the cleanliness for your safety, so you are less likely to get infections than if you do the waxing for yourself. As it is very difficult to see ourselves properly in these areas, it is obvious that the technician will be more thorough by removing all the unwanted hair. Also, a professional works very fast, so you need to suffer from the pain for a shorter period of time. Nearly every woman has leg hair removal done in one way or another. The goal is to be as hair-free as possible in this area and have smooth, nice-to-touch legs. Therefore, you need a method that doesn't irritate your skin or make it red, and after which the hair doesn't grow back very visibly and stubbly which can be unpleasant to touch - or, with a permanent method, it doesn't grow back at all. Waxing - Although it can cause skin irritation, waxing is a good solution to get smooth skin for 3 to 6 weeks if you keep the rules properly. Read more about safety precautions here. Epilator - Leaves your skin smooth for up to 4 weeks and the hair will grow back finer. Although it can be painful the first few times, it is ideal for sensitive skin. Laser - Although it is not a permanent hair removal method, laser is ideal to cover large treatment areas. Having more than one laser treatment slows down the growth of hair, making it thinner and finer at the same time. Can you reduce hair growth by changing your diet? Excessive amount of hair is very often caused by the elevated levels of hormones or insulin resistance. Doctors often prescribe taking hormone pills (for example birth control pills) in instances where excessive hair growth is caused by abnormal hormone levels. Although birth control pills usually help this problem, it can have other side effects that you may not want to risk. It is recommended to try natural remedies first - sometimes simply changing your diet can give a visible result. If your diet contains high sugar or carbonate levels you are more likely to develop insulin resistance. By reducing the amount of sugar or refined and white flour you are eating, you can reduce your risk to hirsutism, thus excessive hair growth. You can also treat this condition by losing weight. Learm more about hirsutism and the diet to treat it. The printable PDF is completely free, we just ask that you give us a like, a tweet or a Google +1 to help support this site and get the word out. Thanks!